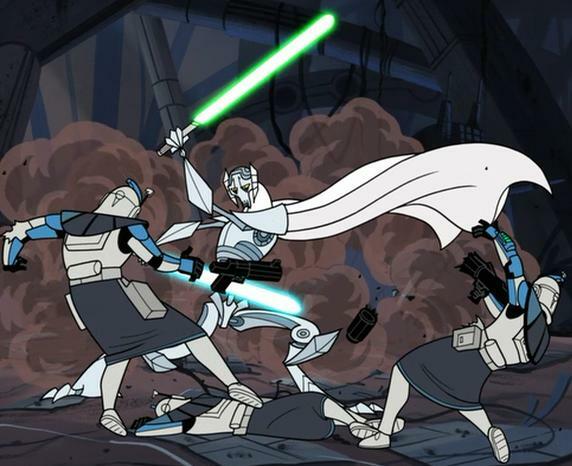 Introduced to viewers before his cinematic debut, General Grievous was portrayed as a vicious warrior in Star Wars: Clone Wars. 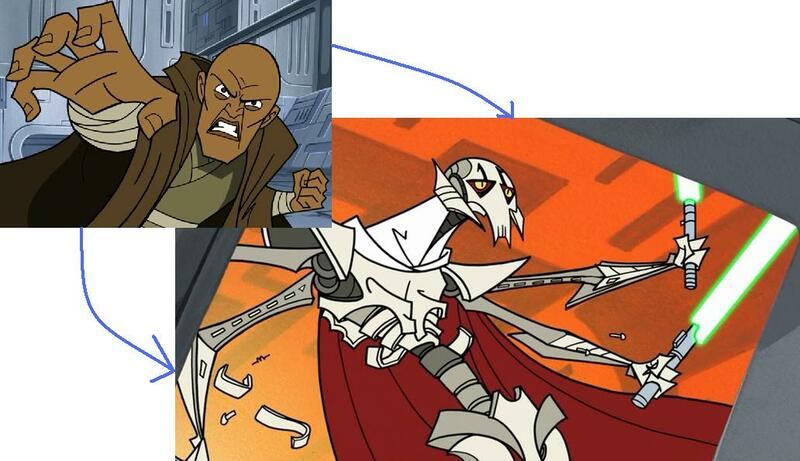 First appearing in 2004 in season 2 and further developed in season 3 of Star Wars: Clone Wars in 2005, General Grievous came to be greatly feared and a strong foe of the Jedi. 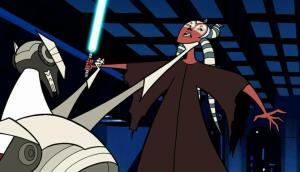 His appearance at the tail end of season 2 was a shocking jolt to viewers, who had come to expect that the Jedi were capable of handling any foe, whether it was Durge in season 1 or Asajj Ventress in season 2. His incredibly surprising entrance was that he was ably handling not only Jedi, but multiple Jedi! After he kills off a padawan and three other Jedi(! ), he is engaging in lightsaber fighting with Shaak-Ti and Ki-Adi-Mundi when he begins spinning his two lightsabers so rapidly as to be undefeatable. He then is able to push away Ki-Adi-Mundi, fighting with Shaak-Ti, until she is thrown against a pillar. 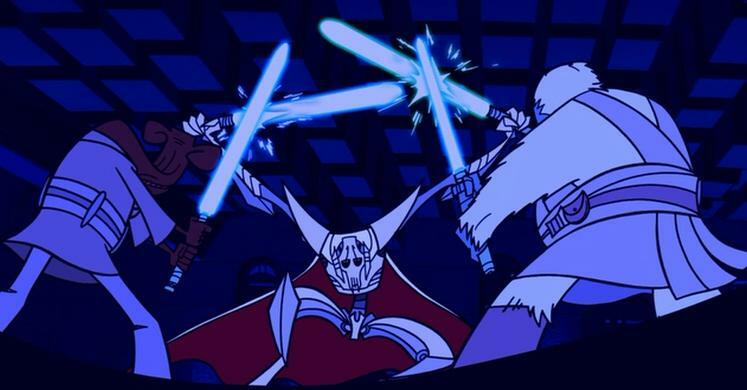 When Shaak-Ti goes to force pull a light saber, General Grievous is able to not only to stop it and to grasp it, but also to wield it as a third light saber with one of his legs. 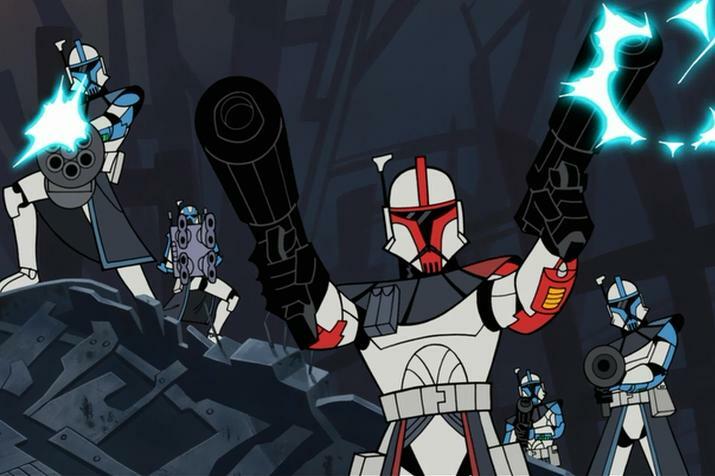 While Ki-Adi-Mundi is able to hold him off a little bit, he is saved when ARC troopers show up and begin blasting away at General Grievous. They are only able to fend him off with the assistance of a Republic attack gunship also firing away at him! Then, Grievous charges again, and Count Dooku uses the Force to send him skidding into some barrels. Grievous leaps up and attacks again. Amidst the suprise attack on Coruscant, General Grievous is able to reach the chancellor’s quarters from the outside and breaks through the windows. 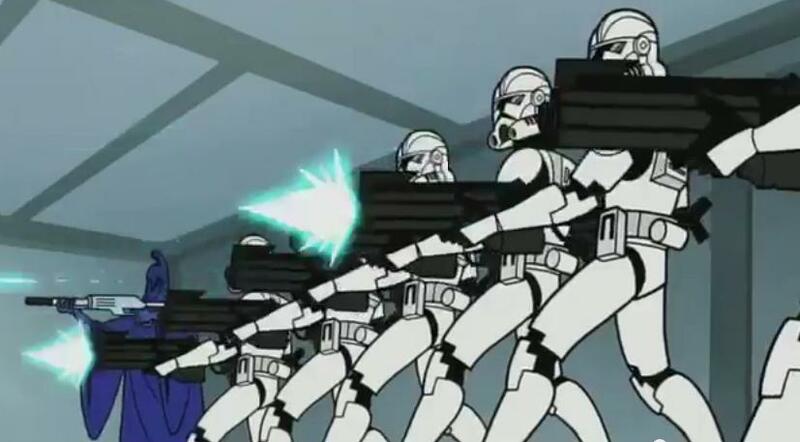 The Jedi escape with the chancellor, leaving Grievous with over a half-dozen clone troopers and some chancellors guards firing at him, yet General Grievous is easily able to kill all of them. Then, while the Jedi are escaping with the Chancellor, Jedi Master Roron Corobb, then used his four Ithorian throats to powerfully blast air at Grievous, and having walls and ceiling collapse onto him, allowing them to escape. Grievous is able not to be blasted away due to his gripping feet, which are quite strong! He is quite indestructible! 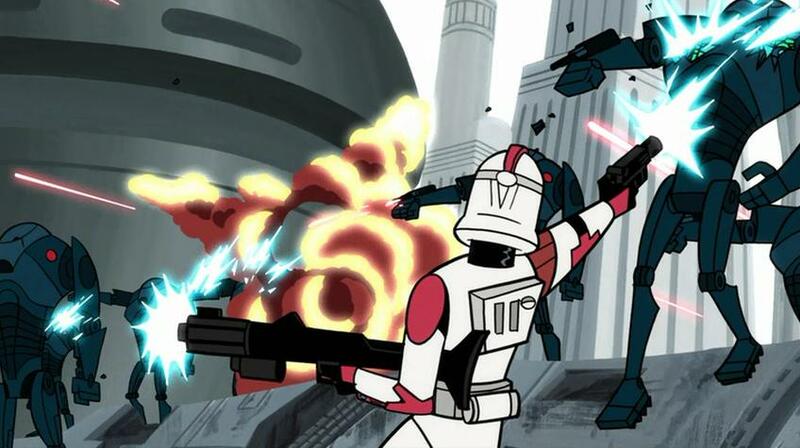 While they use they elevator to descend to ground level, he is able to catch up to them on the building, using his claws and a clone trooper blasts away at him with a bazooka, yet that doesn’t do any harm to him. Once they arrive, they are met by Grievous and scores of super battle droids; once again, Roron Corobb yells away, which sweeps the super battle droids off their feet, yet Grievous is able to advance on them, using his claws. 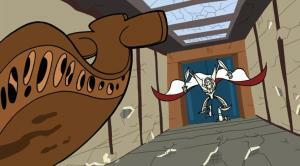 At the conclusion of a battle scene in the train station, Shaak-Ti is able to send General Grievous away on a train (against his wishes) and they flee, yet, somehow, General Grievous is able to get to the most secure location for the Chancellor, where Jedi Masters Roron Corobb and Foul Moudama are there to engage him in light saber battle to defend the Chancellor. However, during their battle, General Grievous suprises them (and the viewers!) with the exposure of his third and fourth arms(!) which are also clutching light sabers(!). He is unstoppable and slays both Roron Corobb and Foul Moudama, enabling him to take the Chancellor. When Shaak-Ti finally arrives, having been delayed by General Grievous’ MagnaGuards, he barely engages her in light saber, before taking hold of her: “You’re tired, Jedi. You won’t be needing this,” taking away her light saber. “I’ve got something else for you,” tying her up. As he is loading up onto his ship, about to head off of Coruscant, Mace Windu arrives nearby and is able to use the Force to crush the insides of General Grievous, causing him to double-over and to experience difficulty breathing, before flying away. 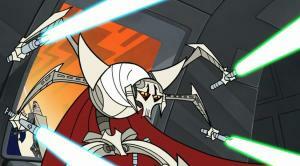 In all, we see that General Grievous is a greatly powerful foe of the Jedi, who can grasp up to four lightsabers at a time, who slays many Jedi, has powerful gripping claws, allowing him to climb up or down, as well as to remain stable despite powerful winds coming his way, and he is able to withstand a lot of blaster shots. General Grievous is very powerful and presented in “Star Wars: Clone Wars” as someone who is pretty unstoppable for the Jedi. However, at the end, due to Mace Windu’s Force Crush on General Grievous, he begins to have not only a breathing problem, but it seems to weaken him, as well.